A creative & ambitious person… a passionate and enthusiastic speaker… a dreamer…an observer…a thrill-seeker; Who believes in looking beyond the obvious and making things happen!!! 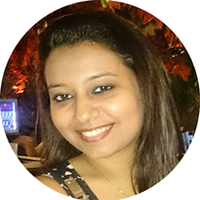 Despite being a management graduate and having an extensive sales/marketing experience, Shraddha is very much a teen at heart. She loves interacting with different people, travelling, shopping, making wacky one-liners and talking lots. Like any typical Indian girl, Shraddha is a total movie freak. She has a keen interest in music, singing and dramatics. So she can really be a ‘Drama queen’ at times. Shraddha hates boring monotony in life and always intend to incorporate a punch of humor and fun in whatever she does. As a Co-founder, Shraddha works to expand and ensure the reach of Fuzia to every woman/girl in every corner of the world so that no talent is left unnoticed and unidentified. Shraddha has many dreams. Yeah, she has her own world of fantasies… She wishes to achieve tremendous success in her corporate career (just like a typical young and ambitious youngster), record her own music album and go for a world tour! !